If you HUD is unresponsive, try this first. You can do this by going to Tools > Reset Scripts in Selection, while in edit/build mode with your HUD selected. Sorry, this is currently only in English, and I can only offer support in English. When using these HUDs, if there’s something you don’t quite understand, I suggest you try it first. I’ve explained everything to the best of my abilities here, and most likely I’m going to redirect you to this website for answers, unless i’m absolutely sure the answer is not here. That said, don’t hesitate to ask me. Just make sure you read this page before coming to me for questions, as your question may be answered here. Further instructions coming soon. Here’s a graphic and a quick start for now (click to make larger). 1. Click anywhere on the color picker to select a color. Use the brightness slider to change … well, the brightness. 2. Press “Apply Color” and your hair or accessory will now be tinted with that color. Sometimes with alpha textures you’ll need to right click or highlight your hair in edit mode to get the color to show correctly. Unfortunately this is an SL bug and I can’t do anything about it. You can save presets by click on one of the arrows pointing into the preset slots. First off, this is NOT a HUD for tinting your hair. Please use the Color Tint HUD for that. To the right is a graphic you can use to view follow along. Text is color coded. Before you get on to ANY of these steps, you must purchase an Infinity Pack of a hairstyle. This HUD will NOT work with hairstyles that are not labeled as an Infinity Pack. 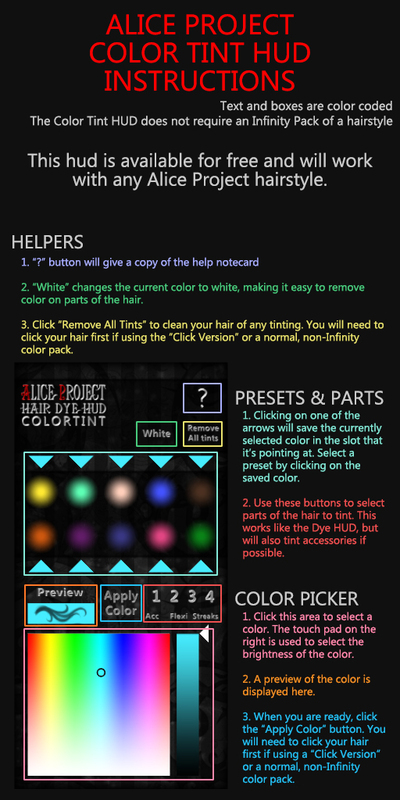 Dyeing your hair can be done in 3 easy steps (maybe 4 if you have a multi-pack dye HUD). 2a Make sure none of the Parts (1 2 3 4, Streaks, Flexi) are selected unless you ONLY want to dye part of your hair. Clicking on a green highlighted number or text will deselect it. Pressing “All” will remove all selections. 3. Choose a dye color from the textures on the right. The HUD will confirm your selection and your hair should begin coloring. If you are using a Create Your Own pack, the color will hold for 60 seconds before going blank again. You may view as many colors as you want before Applying a permanent color. Packs are usually Naturals or Colors but watch out for special packs that deviate from the norm! Some HUDs have only one “pack” and therefore you won’t need to click this button much. At the top of the HUD there is a small bar that has all of the colors available in a specific color pack. Clicking on these will bring up a a selection of colors or shades in that color group. Select the part of your hair you want to dye. Hairstyles can currently be broken up into 4 parts. Streaks for a hairstyle can also support up to 4 streak sections/parts. If the “Streaks” or “Flexi” option is highlighted, the HUD will only dye these parts. If neither is selected, it will dye everything in the part that you select. You can deselect part (1, 2, 3, 4) by clicking on the number again, or by clicking the “All” button. The all button does not clear Flexi or Streaks, so make sure you click on of these first. Now is the time to click on one of the colors at the bottom. After a second or two (or longer, depending on sim lag) your hair will start to change color! Yay! Here is a basic explanation of the five buttons at the top of the HUD. A more detailed description of some of these features is below. Selects a random color from every texture available in the HUD. Toggles the full bright state of your hair. Used to make script-less copies of your hair. Please use this feature with CAUTION as I will not give refunds for or replace hairstyles because you accidentally deleted the scripts in them. If you DO mess up, please visit the store and use a redelivery terminal. Using this while hair is rezzed on the ground will allow the hair to rename itself for you. Help button, gives you another copy of this notecard, just in case you lose it/delete it for inventory space and need another one. Minimize button, folds the HUD off to the side into a slim bar. Click anywhere on the bar to unfold it. The HUD checks silently for an update each time you put it on. In the event that there is an update to any of the dye HUDs, when you put them on, they will automatically send you a copy of the most recent version. Basic HUD functions are the same, so please see the previous section on using Hair Dye HUDs if you’re confused about that. Create Your Own packs require you to “Apply” your color once you have chosen it. To apply it, just click on the Apply bar sitting on the top of the HUD. This will give you a warning that what you are about to do is PERMANENT and if you’re sure the last color you picked is want you want. After you’ve applied the base color, if the hair allows for it, you may still continue to use the HUD to dye streaks. 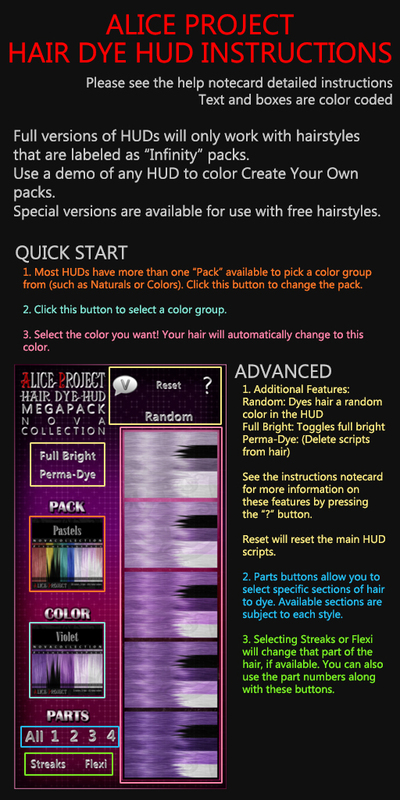 Each Create Your Own pack contains 5 hairstyles so you can pick up to 5 colors. CYO packs are NOT redeliverable to prevent people from just buying one pack and receiving copy after copy for free. If you want more colors in this pack, you must buy another pack. Think of it like the color packs of other hair designers, just with this, you get to pick your own colors rather than be limited to however I would group colors.